As a values-driven company, making the world a better place has always been at the heart of everything QBP does. We use the below principles to guide our actions so that we may have a positive impact on our industry, our communities, and each other. We behave with the highest sense of ethical conduct; we live and act with integrity and honesty. We are deeply trustworthy and honorable. We seek deep partnerships based on trust and respect. We create solutions that have all parties thriving. We prefer transformational partnerships over transactional ones. We make a difference to others every day. We bring our specialness to work, have fun, be the change we want to see happen, and transform the world. We care immensely about our personal contribution. We work hard, smart, and effectively. We set goals high and we celebrate success. In every decision and action, we consider the customers first. We never lose our focus on our customers; we exist to serve them. Ultimately we seek to Be an Extraordinary Business by serving our partners, employees, and communities. We are good stewards of the environment, advance bike-kind, have a strong culture and organizational health, all on a solid ethical and financial foundation. QBP supports regional and statewide organizations that promote bicycle advocacy with local governments. It often takes a blend of local, grassroots knowledge and government support to get initiatives off the ground. QBP backs organizations that work on the expansion and creation of trail systems. Any kind of trail from singletrack to paved urban trails can increase participation in cycling, so each mile of new trail built means more butts on bikes. QBP believes in supporting local projects that have a big impact on their communities. By promoting cycling, we are fighting poverty, overcoming transportation and employment issues, and promoting a healthy lifestyle in underserved communities. QBP helps guide and fund efforts to ensure that bicycles are an essential part of balanced transportation policy. We work with politicians and bike lobby groups to make sure cyclists’ needs are being considered. Sustainable business practices are deeply connected with the health of our planet. QBP constantly works to reduce waste, lower energy consumption, and find more efficient ways to get and distribute goods. QBP built our distribution centers in Minnesota, Utah, and Pennsylvania to LEED standards established by the U.S. Green Council. The buildings are designed to save energy and resources and minimally impact the environment. Our facilities feature solar panels, comprehensive recycling, buildings made with repurposed materials, and even on-site vermiculture composting. Not only are these buildings environmentally friendly, they're kind to the bottom line, too. Square foot for square foot, the energy-frugal facilities generate bigger long-term return on investment than conventionally built structures. Almost all of our sustainable features have an ROI of less than 10 years. 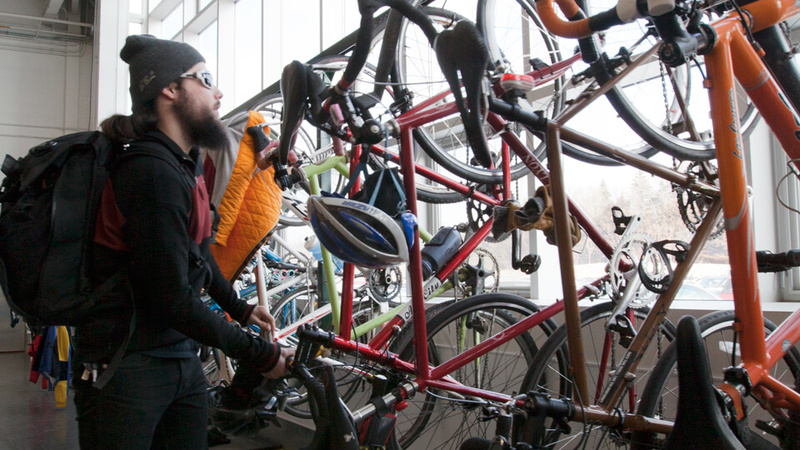 Group rides into work are common at QBP, and a great way to start any day. The benefits of commuting by bike are far greater than saving money on gas and taking in some pleasant scenery. People who regularly bike to work enjoy better health, experience less stress, and are happier and more productive—at work and beyond. They are also doing their part to create a more sustainable environment. And what better way to experience the pure joy and freedom of cycling than gliding past traffic jams on your way to work?